The control system is what pulls it all together and puts it on your smart-phone or touch pad. It is the brain that runs the Lighting Controls, Audio/Video, Surveillance, Shades, Landscape Lighting, Pool, etc. Specifying the right system for your home is critical to your overall satisfaction with your systems. There are multiple options out there and we will work with you to determine which one meets your needs and budget best. We represent all of the major manufacturers and have experts on staff that are well-versed on each one. Every control system has plusses and minuses ranging from capabilities to aesthetics to cost. All of them can operate from a combination of the manufacturer’s remote, to wall-mounted keypads, to your smartphone or tablet. 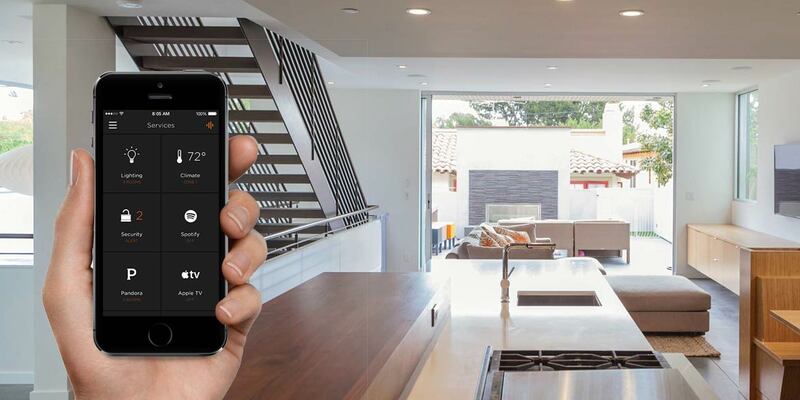 The smart-home capabilities are only limited by your imagination. We could set a button on your smartphone to “RELAX”. Press it on your way home at the end of the day and it will turn on the hot tub, dim the exterior lights, put on your favorite music, light the landscape lights, and ignite the fire pit to set up your outdoor oasis. In case of an emergency alarm like a fire or intrusion, all of your lights will come on, your shades will all go up, and your exterior lights will flash to alert the authorities to your exact location. The control system is really the icing on the cake. Let us walk you through the possibilities and capabilities.